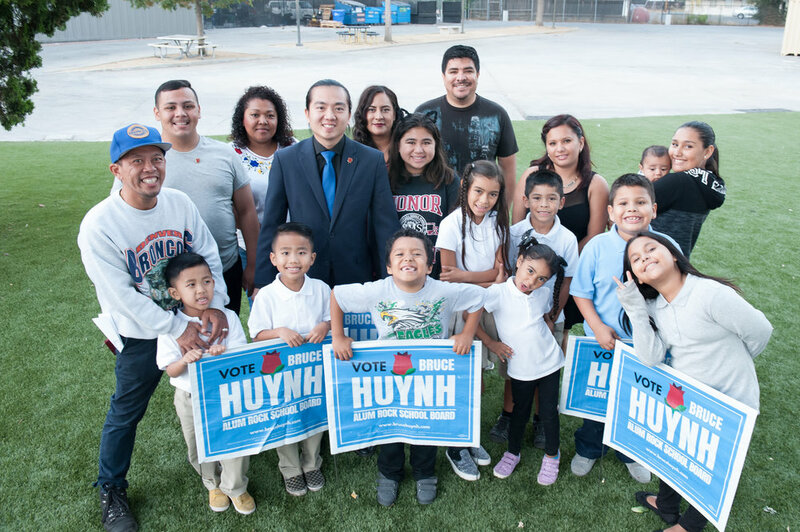 Vote this Nov 6, 2018 for Bruce Huynh, a teacher from the community, for the community. Together, we'll make sure to put kids first above special interests, profits or personal egos. Dear Neighbor, I’m Bruce Huynh, San Jose public school teacher. I’d like to share with you why I’m running to be a school board member in the Alum Rock School District. I was born in Vietnam and came to the United States when I was just a teenager. Today, I am a proud product of public schools in San Jose. I earned a bachelor's degree in political science from UCLA and minors in Labor studies and Asian American studies. Following graduation, I returned home with a mission to help our community. With Working Partnerships, I made direct conversations with thousands of people and guiding them to access affordable healthcare. While at SEIU, I went door to door in the fight to obtain better working conditions for early childhood teachers. It is there that I saw firsthand the resiliency of the common people in the face of major hardships. I saw the power of community when we come together to fight for change. My parents had to struggle and endure many hardships to make a life here. When my father was working at a restaurant he had his wages and tips stolen by the boss. My mom often had to juggle the rent, food, utilities and the pair of shoes I needed to play on the basketball team. When I teach in the classroom, the stories of our youth reminded me of the sacrifice and the strength of our communities. Together, we can fight to ensure equal access to education for our students. As an immigrant community, we do well when we provide adequate support for our students of all backgrounds. As we equip students for a new global economy, we do well when we provide safe spaces for all students to develop their own identities, to thrive with their unique differences. I am running this election cycle because Alum Rock needs us to rise up. For far too long, the conditions of our schools have been neglected, and the voices of parents and the community have been ignored. When our students are facing the tough challenges ahead, they need a helping hand, not politicians who are more concerned with their political future. As an immigrant, a teacher from a working class family, I am running to be a voice of change and hope for our children. Please vote for me in the general election November 6th, 2018 and lend me your support.